The migratory habits of the black kite are complex, but generally the populations at higher northern latitudes migrate southwards over winter, while those nearer the equator remain in the same area year round. This typically involves European populations moving south into sub-Saharan Africa and the Middle East, whilst populations north of Pakistan and the Himalayas travel into south Asia. Although populations closer to the equator, such as India, Australia, and central and southern Africa, tend to be sedentary, some do make small migrations in association with the seasons as well as in response to food supply and rainfall (4). The hugely diverse range of food consumed by black kites varies from region to region and across the seasons. All types of carrion form an important part of this species' diet, but a notable variety of live prey, such as insects, reptiles, birds and small mammals, are also taken by this agile raptor. In urban environments, black kites are known to forage on human food scraps and garbage, and daringly steal food from market stalls and even people (4). Flocks of black kites are also commonly seen gathering around bush fires to pick off the hapless animals feeing the flames (6). 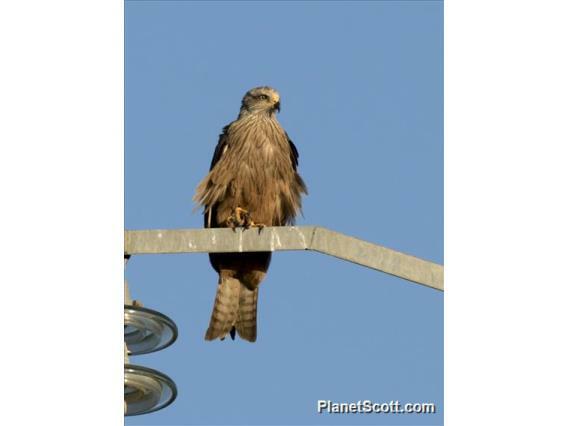 The black kite is an extremely gregarious species, particularly when feeding or roosting, with several thousand birds sometimes coming together in one area. Some pairs may breed solitarily but usually loose groups are formed, as is commonly seen in urban areas where nests may be made only a few metres apart. Aside from high circling, slow flapping and diving, the aerial displays during courtship are fairly limited but occasionally a pair will interlock talons in mid-air. The nests are built on tree branches, cliff ledges, pylons or buildings and are made from sticks and twigs lined with softer material, often comprised of rags and plastic (4). The typical clutch size is two to three eggs which are incubated by the female for around a month before hatching (4) (6). The young fledge after 42 -56 days and become independent another 15 to 50 days later (4). Mobbed by them while trying to eat lunch at the hippo pond. All over the place, the photo is from a spot on the road outside of town.